for V 5.1.1.1000 User Agent Maxthon is not matching with YouTube Display, The Screen Displays other other customize user agents except Maxthon?? I can't understand exactly what the problem is? I think it sounds like you're using the youtube centre extension which no longer works with the latest update to youtube. Disable that, restart the browser and see if that helps. If you're not using that extension, then i'm not sure what the problem is. I tested using most of the UA options and all show youtube properly. I think it sounds like you're using the youtube centre Git Hub extension which no longer works with the latest update to youtube. I dont want to disable it, sorry... I want to bring this to the attention of developers. I think youtube centre extension is a good feature which I dont want to forego, It is unfortunate that this version ignored it. I think it sounds like you're using the youtube centre extension ( which no longer works with the latest update to youtube. You're bringing it to the attention of the wrong developers. The same issue happens on all browsers that use it as it was designed for the old version of Youtube. So it's either disable it and have a working Youtube with some missing features, or live with a broken youtube. Indeed it is, but if it's broken, it's somewhat pointless. So just to reiterate - this is not a Maxthon issue. It's a third party extension problem that needs to be fixed by the extension creator. 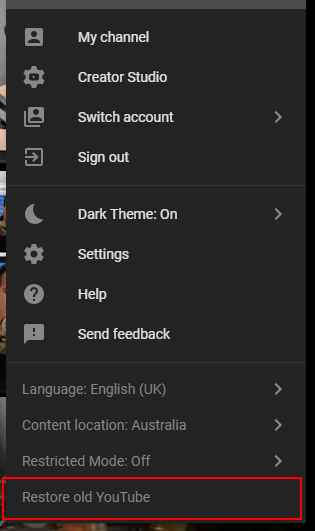 So it seems you can still use the old version of youtube, at least for the time being until google force the update and disable the option. From the user menu choose the "restore old youtube" option as shown in the image. Haven't tried it myself, but assuming it is actually the old design then it should work correctly.